Many florists choose to host flower arranging classes as a way to make extra money, market their businesses, become more involved with the local community or some combination of all three. But hosting flower arranging classes is not as easy as simply finding a space and bringing a few flowers along. Pricing the classes correctly, advertising the classes, collecting the right supplies and teaching practical skills for which the students show an interest are all important to hosting successful flower arranging classes. Some florists are lucky enough to be asked to offer flower arranging classes, but even those would-be instructors need to enrol enough students to make the classes profitable. Florists should first take into account how much the class would cost them, including their working hours, rent for a space, the price of materials and any other associated costs. Dividing this total by the number of prospective students will yield the price that each would need to pay in order for the florist to break even on the courses, so florists should add extra to this number in order to make a profit. If the price seems to high florists may need to consider taking extra students into classes, hosting a class in a space with more reasonable rent, offering the classes outside of their working hours or playing around with potential materials until these necessary costs are lowered. When it is decided when and where the classes will be held, and how much the classes will cost each student, florists must make an effort to advertise their classes. Leaflets in their own shop and on local notice boards are no-cost options for advertising, as is adding the information to the florists' existing website or blog. Running ads in the local paper or in community newsletters might also be options. If courses are run through local educational institutions then these organisations might have advertising opportunities as well. Getting the class details into as many different outlets as possible is important in order to reach the widest number of potential students. Once florists know how many students they will have for each class they can begin to count how many sets of supplies they will need to bring. Basic items such as a variety of flowers, greenery and vases or other containers will be necessary for most flower arranging projects. Wire, foam, scissors and ribbon will also be important to have on hand, as will sinks with running water and adequate outlets for rubbish disposal. Obviously more specific projects will also require more specific supplies. If class participants will need something to transport their arrangements home then florists may also want to have extra boxes and bags on hand to be able to pass out as required. 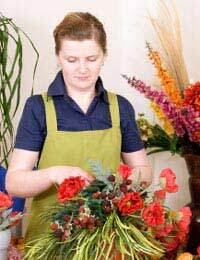 Florists interested in hosting flower arranging classes must be prepared to teach these classes themselves unless they can afford to bring in a guest presenter. In order to feel more comfortable teaching, florists might want to start by offering small workshops or seminars to select groups. The ability to clearly offer instruction while demonstrating practical skills will be invaluable to florists interested in teaching classes, as will the ability to make small talk and encourage each and every one of their students regardless of their skills. In order to be able to gauge the level of teaching required, florists might want to offer classes based on skill level, such as beginner, intermediate and advanced, so that they can offer more targeted instruction to each group.